MiddleOne is an even number old. The difference between his age and EldestOnes age (also an even number), multiplied by SmallestOnes age (which is a prime number), yields MiddleOnes age. The first digit of MiddleOnes age, added to Smallest ones age produces an number which is half of EldestOnes age. In celebration of his ontaining this age, we had Pizzza tonight, MiddleOne alos recieved building presents, I think we kep Lego SA afloat. For you South Australian's out there in the bloggosphere, you might be interested in the ASSA's public lectures coming up. 100 Hours of Astronomy Starts Thursday! 100 hours of Astronomy, a key event of the International Year of Astronomy, starts Thursday April 2 and runs until Sunday April 5. There are a number of International events. Sadly, the Science Centres Webcast occurs around 3am on the morning of the 23rd for us. However, Around the World in 80 Telescopes is a 24 hour long webcast, which we can access. There is also 100 hours of Junior Astronomy. What's happening in Australia? 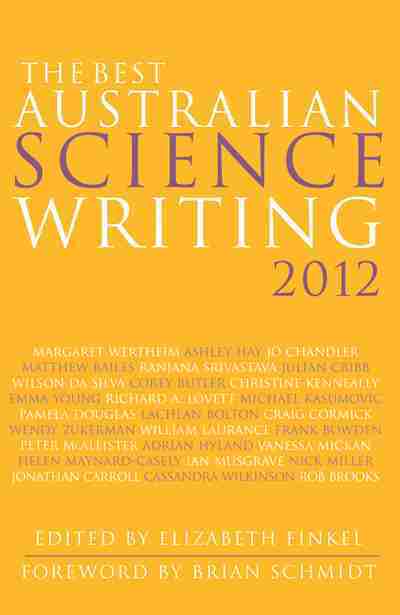 Go to the Australian IYA site and look at the Calendar of Events. Check out your local astronomical societies or planetariums events. 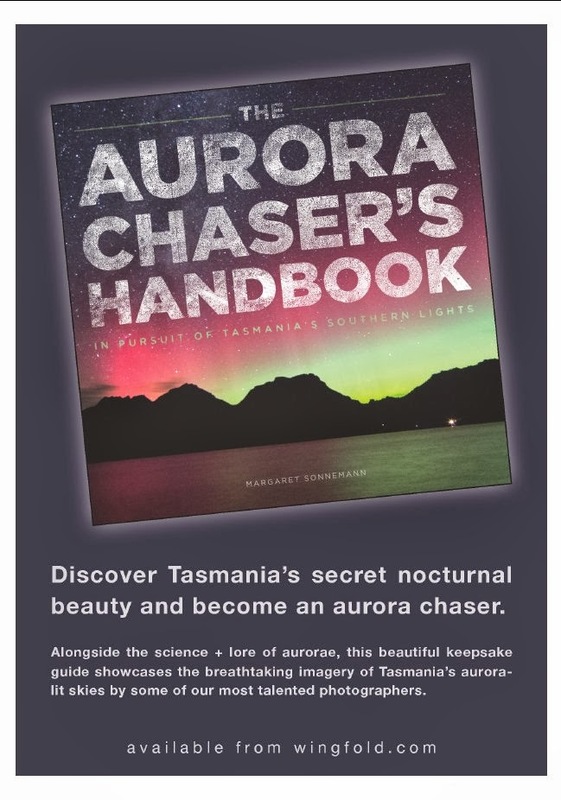 For Example the Astronomical Society of South Australia is holding public lectures on Thursday and public viewings on Saturday. What else can you do? You could hold an impromptu star party! The 24 hour Global Star Party is on Saturday 4th April, all you need is a patch of sky and some friends and neighbours. You don't even really need telescopes or binoculars, just navigate your way around the sky and look for meteors or satellites. 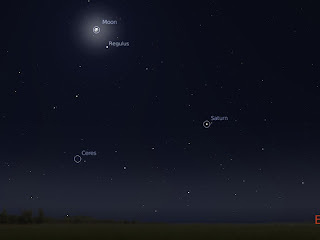 The Moon is crescent to First Quarter phase, ideal for pointing telescopes at, and Saturn is high in the sky and a big hit with everyone (on Saturday night the Moon will be near the Beehive star cluster, very nice). So get out, and look up. You're guaranteed a good time! We invited some friends over for Earth Hour, and I set my small telescope up on the footpath just outside our house to do some footpath astronomy. In the end we only garnered the next door neighbours though. I had set up the 4" on Saturn. I was also going to set up to little 50 mm refractor, but the objectives were nowhere to be found. People lined up to look at Saturn, and kept on looking. Eventually, after much adjusting of the scopes position. I dragged out the 8" with the drive and set that up. Why didn't I set that up first? As I was running a bit late due to time overruns on cooking the lentil burgers, I didn't want to violate the spirit of Earth Hour by having the lights on as I navigated the massive scope through our narrow doors to out front. In the end someone with a massive torch helped guide me outside. I set the 8"scope up with a 12 mm eyepeice and a 2x barlow and left it on Saturn, where it was continually watched by a steady stream of participants. We couldn't see Titian's shadow, but we couldn't see Titan at all until late into the night, even though we could pick up Dione and Tethys. The small scope was then relegated to Orion's nebula, the Eta Carina complex and double stars. By the time we had packed everything away, it was 11:30 pm! We had gone well beyond the "hour" of Earth Hour (and no, I didn't notice any diminution of sky glow), and everyone enjoyed themselves. Some brief rules for a footpath astronomy star party, for what I learned that night. 1) Make sure you have all your telescopes set up well before hand, having at least two scopes really helps or one object will monopolise your time. 3) Set your gear up on a foot path which will have some traffic on it, rather than just outside your house on a very quite street. 4) Make sure you have the scope eyepiece orientated for ease of use, especially by younger participants. Always have a small stool with you so they can stand on it. 5) Make sure your finder scope really is aligned before you set things up, or most of the night will be people watching you struggle to get something into the field of view. 6) If you are doing satellite watching, make sure you are checking your "glow in the dark" watch frequently, or you will completely miss them. Globe at Night, a world wide collaboration to get people to look up at the sky and to understand the effects of light pollution, has been extended until March 28, and you can fill in the observing forms until April 7. You participate by observing the constellation Orion, estimating the number of stars you see, and filling in a simple report. You can do this as an individual, organise a star party with friends or get your kids involved. Saturday March 28 hosts Earth Hour, so this would be a good time to observe for the Globe at Night, to contrast light polluted nights to the special "switch off" night. The western horizon as seen at 8:30 pm (local time) Saturday in Australia (click to embiggen). Earth Hour is upon us! Various city councils, businesses and local citizens will be turning off their lights from 8:30 - 9:30 pm this Saturday (28 March) in this global action to raise awareness about climate change. For suburbanites, the sky will be darker than usual, and rather than huddle inside reading by the light of torches, why not do some astronomy? At 8:30 pm the beautiful Pleiades cluster will be lowering to the western horizon, above that is Taurus and the "V" shape of the Hyades cluster, then above that is Orion and his belt. To the south the Southern Cross is clearly visible, with the beautiful star fields and clusters of Carina and Vela (the keel and sail of the ship Argos) are well above the horizon. If you have binoculars, then these fields are georgous to behold. Look for satellites going over; Genisis II, Various cosmos rockets and delta stages are going across the sky from 8:30 to 9:30, why not pop over to Heavens Above and get satellite predictions for your location? There is a good Iridium flare around 7:30 pm (but that's not part of Earth hour). If you have a telescope, small or large, why not invite friends over for an impromptu star party? If you have a small telescope, why not set it up on the footpath for some footpath astronomy and show the sky to passers by? Especially Saturn at this time. If you have a large telescope, why not try looking for the shadow transit of Titan? So come Saturday night, why not show some support for climate change action AND take advantage of suburban dark skies? So I brought some dry-ice (frozen carbon-dioxide) home, and we proceeded to play it it. (caution, dry ice can cause serious freeze burns, so always closely supervise children around it). We put it in water, dumped some in the sink to see the fountains of mist it produced (and the fountains of smoky bubbles from the detergent in the sink). Added some Ph indicator to watch the indicator change colour as the CO2 made the water more acid, and look at the change of volume in going from solid to gas. We put about a cup of dry ice into a disposable washing up glove and watched it swell. MiddleOne added the eyes and such and it became Octy the Octopus. It swelled and swelled, dramatically showing the difference between something in solid phase and the equivalent amount of matter in gaseous phase. Great fun was had by all. Oh, and no rubber gloves were harmed in this experiment, Octy didn't explode, and is sitting on the table at the moment. On Saturday 28 March, there will be a shadow transit of Titan. Titan itself will not cross Saturn's disk but its shadow will the best time to star observing is around 9:30 pm local time. See Mike Salway's article detailing the times you can see this and coming shadow transits. A group of Spanish highschool students used an ordinary weather balloon and a camera they made themselves for around $60 US to photograph the edge of space. Neuron culture comments on the story here and here, and the students site, with stunning photos, is here. This is amazing, go visit now. Carnival of Space #95 is here. The Carnival of Space #95 is now circling the OrbitalHub. There's the prospects for finding Red Dwarf "Earths". The Habitable planet "bubble", the search for Planet X, looking deep in the Southern skies, Galactic Doom (Bah Dum! ), a bat on the space shuttle and much, much more. Fire your retro-rockets and head on over! The Moon and Jupiter reflected in a pool of water (click to embiggen). Seen at 5:30 am from Adelaide on Monday March 23. Daylight Jupiter was pretty much a bust. Colud see it just after sunrise, but at later hours it could only be picked up in binoculars. I was wrong, Comet Al was right. The field of views of the H1A imager during its rolled configuration WAS in Pisces. Rainer Kracht has identified my two probables in H1 as 234 Barbara (at mag 13.2 possibly a record for detecting faint objects in STEREO) and 128 Nemesis. The H1B field is in Capricorn/Aquarius. I haven't identified my unknown candidates yet, but I have eliminated 93 Minerva, 20 Marisalia, Neptune and 89 Julia (and 19 Fortuna). So far I have no further candidates, but I would be surprised if it turned out to be an unknown. Still, I'll do some more looking tomorrow. The bright object is almost certainly 324 Bamberga (Mag 11.0) and the dim object is almost certainly 19 Fortuna (Mag 11.7). So, no L4 or L5 asteroids. As well, I'm now alpha tested of some cool sky mapping software, I'll tell you about this later. Run, don't walk, to the Bad Astronomer to see this amazing animation of Jupiter and its Moons going behind the STEREO COR2B imagers occultation disk. This is fantastic. Is this an L4 asteroid? UPDATE: No, it's not an L4, it's 234 Barbara. See here for further explanation. On March 12 and 18 the Stereo Ahead craft and the Stereo Behind craft respectively did a 180 degree roll to image the L4 and L5 Lagrangian regions. The Lagrange points are gravitationally stable points where researchers believe asteroids can accumulate. There are around 1000 asteroids in Jupiter's Lagrange points (but apparently none at Saturn's Lagrange points). The Earth's Lagrange points lie close to the Sun, so imaging them from Earth is pretty hard, and we have no real idea what lurks there. However, the Stereo spacecraft are about to pass the Lagrange points on September and October this year (see this orbit animation). This month though the two spacecraft were rolled to image the Lagrangian points for about 6 hours. So what was revealed. Not much. I've gone through both the 12 March and 18 March images, and there is nothing really outstanding, so the area imaged didn't contain any really big rocks. There were 2 asteroidal candidates in each sequence, however, trying to exclude know asteroids has hit a snag. I have no idea what I am looking at. According to me, Stereo A was looking at Pisces, and a 180 degree roll should make it look at the Virgo/Leo border. However, comet Al reckons it should be looking at a different segment of Pisces. My spherical geometry is sufficiently rusty that I have no idea which of us is right, and trying to match up features with both most likely frames is a nightmare. 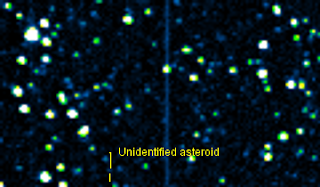 Nonetheless, this object looks sufficiently interesting, its faint, but not a "Hot Pixel", and best of all, it is nowhere near the asteroidal and cometary candidates I can find in both alleged stereo A fields. Here's an animation of the object (bottom lefthand section of the image). It still could be a known object, I just have to spend a decent batch of time trying to work out where the actual field is. Also, as the area was only imaged for about 6 hours, there is not much time to establish an orbit. Lagrange asteroids should be moving very slowly with respect to the Stereo craft, and more or less in the ecliptic plane (similar to my 4 objects) so picking them up will be hard. In the "Just because I can" department. I've re-stacked my images of the Death Dive of Tony Hoffman's Kreutz comet. This comet was discovered by Tony Hoffman on the 21/2/09 in SOHO C3 images. The comet brightens rapidly, then evaporates before it passes behind the Sun. I've made a longer animation that shows the comet evaporating (1.5 Mb). I posted the animation on YouTube (see below), but for some reason the final frames don't come up on YouTube. 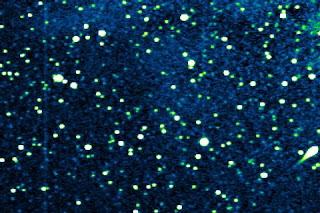 Images form the stereo COR2A instrument were stacked in ImageJ and warm green-blue LUT applied. I got up to see the ISS go overhead this morning. Before I turned on the computer to check the pass time, I stumbled out to see if the sky was clear. The Sky was cloudy, with a few ragged holes where the Moon and Jupiter shon through. While gaoing unintelligently at this spectacle, the ISS passed through a hole in the cloud. Man that thing is bright now. It played tag with cloud holes as it passed the Moon, then dissapeared into a band of thick cloud. If I had stopped to turn the computer on first. I would have missed it. The eastern horizon at 5.30 am as seen from Adelaide, similar views well be seen in Australia and most of the southern hemisphere. The track of the International Space Station is as seen from Adelaide, the track will be very different in other locations. Jupiter and and the Moon will be very close, with Mars down below, this will be an attractive way to start the day. As well, in many places in Australia the ISS will pass close to the line up, check Heavens Above for predictions for your local site. 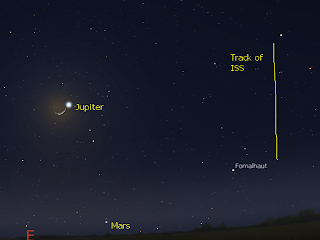 With Jupiter only a fingerwidth from the 15% illuminated Moon, you can use the Moon to locate Jupiter after the Sunrise. 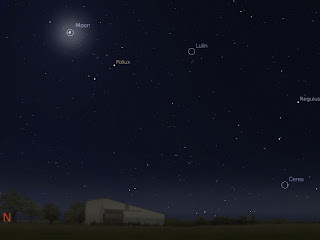 If you start obseving before sunrise youcan follow the Moon and Jupiter as the sky brightens. Be sure that you keep the Sun hidden behind a large object such as a house so you don't have any risk to your eye sight. Comparing Galileo's drawing of Jupiters Moon's (top) with a modern prediction for the Moon's appearance at that time (Below). For a drawing using a fairly ordinary telescope , drawn by hand and then made into a woodcut, it's pretty accurate (scaling between the images is different, sorry). The small stars in Galileo's diagram represent Jupiter's Moons. Continuing my reading of Galileo's Sidereus Nuncius (The Starry Messenger). Galileo's audience have been shocked by the revelation that the Moon was not a perfect object. They were stunned when the Milky was was revealed to be not an etheric glow in the celestial spheres, but myriads of stars to small to be resolved to the unaided eye. But the next revelation was the most amazing. Galileo was the first to discover completely new worlds. On the seventh day of January in this present years 1610, at the first hour of night, when I was viewing the heavenly bodies with a telescope, Jupiter presented itself to me. And because I had prepared a very excellent instrument for myself, I perceived (as I had not done before on account of the weakness of my previous instrument) that there were three bright starlets beside the planet, small indeed, but very bright. The " very excellent instrument" was probably no more than 20x in magnification (you can get a replica yourself). Now, Galileo was not expecting new planets, indeed nothing would have lead anyone to expect there could be more than the 7 classical planets. But he did note that the three starlets to the east of Jupiter were aligned with the ecliptic. Unusual and interesting, but not the harbinger of new worlds. Imagine yourself looking at three tiny stars near Jupiter, how would your realise that these dots were Moons, not stars? The next night though the three stars were on the western side of Jupiter. Note how cheekily Galileo inserts a heliocentric idea in the text, true it could be referring to Tycho Brahes system, but throughout the Starry Messenger there is more than a hint of heliocentrism. However, his discoveries were so astonishing that most people ignored the heliocentrism and attacked the existence of mountains on the Moon, and Moons around Jupiter. Most of the rest of the book is list after list of Jovian Moon positions. Given that the man had just discovered new worlds, the dry list may come as some surprise. However, it had an important point, and people scoured this section very attentively. Galileo had to establish beyond doubt that the starlets really did circle Jupiter. One way was to establish orbital periods for the starlets, which require two things, accurate measurement of the starlet positions, and some way to identify individual Moons. The furthest starlet was easy, no other Moon went so far from Jupiter, but distinguish three near identical points of light as they merged and separated was an enormous task. Galileo did not achieve it in the Starry Messenger, but did later on. He did get an approximate orbital period for the outermost starlet (IV, which we now call Callisto), and this approximate period got him in trouble later. Also, he was able to show by comparing the motion of Jupiter and the starlets to the fixed stars, that the starlets moved in latitude and longitude exactly with Jupiter. The Moons orbited Jupiter. But now we have not one planet revolving around another while both run through a great orbit around the sun; our own eyes show us four stars that wander around Jupiter as does the Moon around the earth, while all together trace out a grand revolution about the sun in the space of twelve years. Naughty Galileo again! More heliocentrisim snuck in. He also resorted to atmospheres to explain the apparent dimming of the Moons as they approached Jupiter (this is really an optical effect due to the brightness of Jupiter). The existence of the Moons was attacked as soon the the Starry Messenger was published. There was some reason to be sceptical. Galileo's telescopes were far from perfect instruments, and there were know artefacts in them. But Galileo's careful observations put paid to those sorts of arguments. The orbital features of the starlets could not be explained by mere artefact. Many attacks were supremely foolish, even by the standard of the times. Francesco Sizzi argued that for metaphysical reasons, there could be no more than seven planets, therefore the Medician stars could not be real. Sizzi had even seen the Medician stars himself. But Sizzi also had a more subtle argument up his sleve. If the Mediciean stars were Moons, he said, then they should show a consistent periodic orbit like our Moon. But the orbits he derived from Galileo's observations did not agree with Galileo's stated orbital period. Which was because Sizzi had based his orbits on an incorrect figure. There were several observational errors in the printed work, not surprising given the difficulties of making measurements with the primitive telescope, and Sizzi started his calculations from an erroneous position for Callisto, and them compounded his problem by taking Galileo's approximate orbital period as an exact one. At this remove, it is hard to understand these attacks, but in those days mere measurement was not match for metaphysics. People were supposed to start from metaphysical reasoning and argue to a conclusion. Observations and measurements came a poor second. However, eventually people like Sizzi were won around by just these measurements. After extended conversations with Galileo, Sizzi derived reasonable orbits and became his supporter. Gallileo's Starry Messenger is a slim book, most of it is taken up with dry recitations of the positions of the Medician stars; Jupiter's Moons. But it held twin revolutions. It began the shattering of the Ptolemaic astronomy, and heralded the heliocentric solar system. And in shattering the Aristotelian version of the cosmos, and emphasising precise and careful measurement, it ushered in the modern era of science, where metaphysics was discarded and observation and careful testing of hypotheses became the standard. Twin revolutions, started by a tube that today we would consider a toy. After the excitement of 2009 DD45, we have another approximately house-sized small body 2009 FH zooming by at nearly the same distance. We will not see it from Australia, and it's a bit of a challenge in the US too. So for your vicarious enjoyment I've made up a Stellarium add-on and a Celestia .ssc file. For Stellarium, you have to add the asteroid details to the ssystem.ini file in the data folder (always make a backup of this file okay). Just copy and paste the section below at the end of the system.ini file. When you run Stellarium, you will have to turn planet hints on in the configuration menu if they are not already on. For Celestia the .ssc file goes into the extras folder. Here the 2009 FH files, data taken from the MPC. If you are unsure of where 2009 FH is use the search function, you have to type in 2009FH for the search to work. Globe at Night, a world wide collaboration to get people to look up at the sky and to understand the effects of light pollution, has started. It runs until March 23, and you can participate by observing the constellation Orion, estimating the number of stars you see, and filling in a simple report. You can do this as an individual, organise a star party with friends, get your kids involved or maybe get your local school involved.The sky is prett nice at the moment, so have a go! I completely missed the transit of Titian on Thursday the 12th, cloud covered the whole sky. Several Australian were lucky enough to see it. You can see their images in this IceInSpace thread. Also, Christopher Go caught some amazing images of this transit. There are no more transits of Titan as seen from Australia this year, but there are several shadow transits, where Titan is off the disk of Saturn, but the shadow is on it. Mike Salway has an article detailing the times you can see these shadow transits. I've been somewhat busy lately, and have been completely ignoring the STEREO data. I may have to turn in my Stereohunter secret decoder ring. However, correspondent Stephen Huntwork has been scouring the STEREO data using a tool called FESTIVAL and alerted me to a comet in the COR2A images on the 22nd and 23rd of February. It looks pretty spectacular (lower image shows comet on 23rd in COR2A). It also turned up in the H1A images on the 22nd from around 00:92 to 13:29 before going off frame (top image, comet is obvious tear-drop shaped object on lower right hand side). 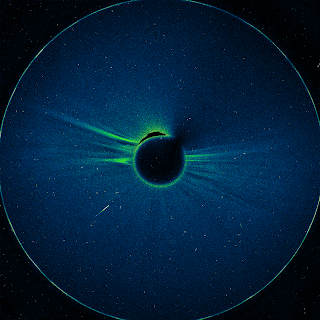 The comet is a Kreutz comet discovered by Tony Hoffman on the 21/2/09 in SOHO C3 images. 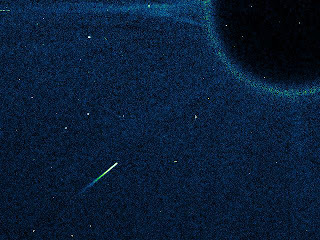 The comet doesn't last long, it evaporates before it passes behind the Sun, you can see it very briefly before evaporating in this SOHO C2 animation. My animations of the comet in H1A and COR2A are here and here. Carnival of Space #94 is here. Carnival of Space #94 is now up at Out of the Cradle. Another bumper issue, this has lots of Lunar related stuff, light pollution, suspended shuttle launches, Mars and Venus, how you can get a replica of Galileo's telescope and much much more. Put on your booties and toddle over. Over at Todd Woods blog until recently you could have found this interesting (and unintentionally amusing) statement. "Anyone who knows me at all knows that I break down creationist biology into four main components: design, natural evil, systematics, speciation, and biogeography." This automatically channels the Monty Python Spanish Inquisition sketch "Amongst our weapons are ..." Anyway, he fixed the numeric discrepancy (without acknowledging the blogosphere who pointed it out), but minor typographical errors are not the reason biologists laugh at creationists . The reason we laugh at them is they are so gormless about biology. 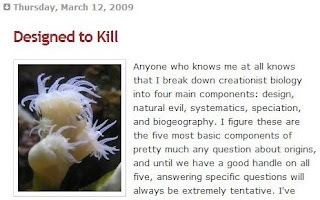 The point Dr Wood is making in that post is that animals (hey what about plants and protists) are "designed" to kill, which implies that God had an *active* role in making all things loathsome and nasty (cue Monty Python again), rather than us sinful humans being at fault and the world just degenerating. just plants to eating meat." Cue the Gary Larson cartoon of two bears watching children at play, and one says "Come on Harvey, look at these claws, these teeth, they're not for eating nuts and berries". Now, Dr. Wood uses the bear as a too simple example, rather than a key exemplar. But the real point is the biology as stated is wrong. Simple examination of the biology of the Panda shows it's a carnivore modified to be a herbivore, rather than bears being herbivores modified to be carnivores (indeed the Pandas gut is only very slightly modified from the carnivore version). Again, this is why biologists laugh at Creationists, they just can't get the biology right. In example after example, Dr. Wood shows that biology is an incoherent mess without the unifying thread of evolution. And he doesn't get it. Yeah, Man sins, evil and death enters the world and suddenly Drosera start thinking, "Hey, I've got these sticky tentacles, and digestive enzymes, I'm gonna get me some MEAT". As another example of the problem Creationist have with biology, I will refer you "Fellowship, Creation and Schistosomes" (Mace, Simms and Wood 2003) where Dr. Wood and others try to explain how the Schistosome parasites could have arisen . Note that this is a technical publication, a supposedly serious research article like a scientific paper. Now this was published back in 2003, and Dr. Woods position has eh, evolved a bit since then, but the paper is still cited as an example of serious creationist "research" and neatly illustrates the problems therein. Now the creationist problem, as stated by Dr. Wood, is that since everything was perfect before the fall, disease only entered the world after the fall. Also, the only post-fall developments could be degenerative, we can't have any of the nasty evolution stuff (at least on anything other than trivial scales). But the complex life cycle of the Schistosomes clearly is a complex adaptation not a degeneration. How can they explain this? They decide that the Schistosmes were originally symbiotic (or mutualistic in some way), and then degenerated into a parasitic condition, possibly by infecting the wrong host. This is in itself not a silly idea, organisms that normally live elsewhere and accidentally get into the wrong tissues of the host can be an important source of disease, like gangrene. But it's how they go about trying to establish this reveals their ignorance of biology. First they try and establish that Schistosomes are a "Created Kind" and compare them to the liver flukes (Fasciola). Now liver flukes also have a complex life cycle similar to the Schistosomes, with larva in molluscan hosts, and the formation of cecaria. On the basis that Schistosomes are sexual, and Fasciola are hermaphrodite and have a slightly different gut architecture, and ones cercaria must be eaten (but still actively burrows in through the gut lining), but the other directly invades via the skin, that they must be two separate "Created Kinds". Well, we couldn't have any of that nasty adaptive evolution happening could we? Except of course that Schistosomes and Fasciola are but two representatives of trematoda, a large class of parasitic worms that include a two host cycle, with one stage usually occurring in molluscs, the second usually in vertebrates. The cercaria is common to all the trematodes. As well as the liver flukes, there are the lung Flukes (Paragonimidae) and the intestinal Flukes (Fascicoliposis). These are just the ones of disease importance to humans. Then there is Bivesiculidae, the Transversotremidae, the Lepocreadidae and on and on. Indeed there are over 180 families of trematodes which have the life cycle and larval stages (including cercaria) associated with Schistosomes. Indeed, the Schistosomes considered by Wood et al are just one genus in the family Schistosomatidae, venous system specialists that infect reptiles, birds and mammals (including humans). Then there is the family of Spirochidae, blood vessel generalists that infect reptiles and Sanguinicolidae, blood system generalists that infect fish (See diagram above right, taken from Brant and Loker, 2005). None of this is new, and was well established by 2003, when Wood's paper was published. Now, Mace et al compare just two genera, and pronounce them separate "created kinds", but when we have hundreds of genera, all with the Mollusc - Vertebrate infection cycle involving cercaria, then the idea that all these genera represent "created kinds" is just a trace unparsimonious (and can invoke Occam's Razor). Or we could say that the "created kinds" just extend to the organ system specialization, but then there is massive diversity which means a whole lot of adaptive evolution is going on, with over a hundred of genera in any given family forming adaptive diversity in a variety of hosts and environments. And creationists just don't like admitting to adaptive evolution. Note the pattern here? Mace et al, want the Schistosomes to be "fallen" versions of a mutalistic organism. What kind of mutualism requires a worm to burrow into the circulation and live in blood vessels is not explained, and there are no good examples of such extreme invasive mutualism. Indeed, given the extreme diversity of trematode worms, and the blood inhabiting trematodes (Schistosomatidae, Spirochidae and Sanguinicolidae) the utter lack of a mutatistic version of the trematodes is very telling. What's more, it is hard to fit the actual biology of Schistosome infection with a "fallen" status. Schistosomes are venous specialists (except for one species that specializes in arteries). They must lay their eggs against the flow of blood, and engage in precision placement of eggs, the females back into the smallest venules and release eggs where the veins clamp down on them and hold the egg in place. The eggs them migrate through the blood vessels and into the gut. Such precision adaptations are incompatible with a "fallen" state. The recurring observations that supposedly "fallen" species have significant adaptations to perform their parasitism and carnivory has resulted in Dr. Woods musings. Creationists cannot accept that evolution is responsible for adaptations, so they must tie themselves in knots trying to explain how God designed in these adaptations (before of after the fall), and thus produced natural evil. Cribb TH, Bray RA and Littlewood DTJ (2001) International Journal of Parasitology 31, 997-1011. As an Australian, growing up with our major religious traditions being Anglican, Catholic and Presbyterian, I find the literalists bemusing. We all get the idea that Genesis is filled with analogy and metaphor, heck I got that at age 10, when I was getting gold stars for my Bible verses, so why can't the Creationists get it? While not a professional parasitologist, I spent 3 years a a laboratory Scientist, and one of my duties was parasite analysis. So I know my way around parasites. It only took me a few minutes to find several contemporaneous references to the evolution of schistosomes that Mace et al didn't cite. 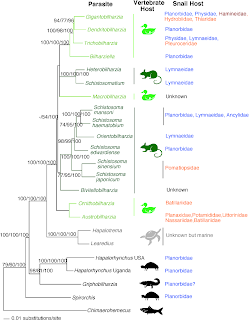 The creationists accept that species which hybridize are related by common descent, just like real biologists do. And the DNA data show that hybridizing species are most closely related to one another, and other similar species are related, and slightly less similar species are related , and so on with no sign of the "discontinuity" the creationists insist on to separate "created kinds". Globe at Night, a world wide collaboration to get people to look up at the sky and to understand the effects of light pollution, is about to start its 2009 campaign. 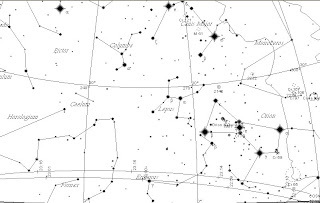 From March 16 to March 23 you can participate by observing the constellation Orion, estimating the number of stars you see, and filling in a simple report. You can do this as an individual, organise a star party with friends, get your kids involved or maybe get your local school involved. 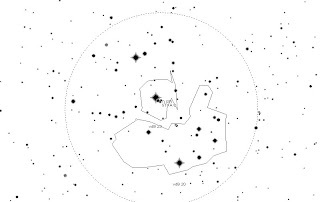 However you do it, sometime between 16 and 23 March, Look UP! 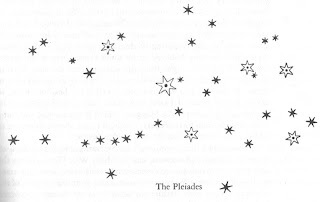 Comparing Galileo's chart of the Pleiades with a modern chart. For a chart drawn using a fairly ordinary (by modern standards) telescope with chromatic and other aberrations, drawn by hand and the made into a woodcut, it's pretty accurate (scaling between the images is different, sorry). The small stars in Galileo's diagram represent stars never before seen by humans. Galileo's audience would be reeling after the revelation that the Moon was not a perfect object. His next shock would not be as great, but would still have an impact. There were far more stars in the heaven than could be seen with the unaided eye. The issue was not merely that these things were new discoveries, but that they struck at the very heart of Aristotelian cosmology, which was in turn a major prop to the Ptolemaic solar system. These observations laid the foundation for the fall of the Ptolemaic system. Galileo spends a lot of time describing the appearance of the stars through the telescope. Again, the words sound strange to us today, as he tries to describe effects we know as largely due to atmospheric turbulence, but he was showing that, unlike the planets, the stars showed no, or very small, visible disks. When stars are viewed by unaided natural vision, they present themselves to us not as of their simple (and so to speak their physical) size, but irradiated with a certain fulgor and fringed with sparkling rays, especially when the [darkness of night is] far advanced. Once he has established that stars appear brighter in the telescope, but not bigger, he goes on to describe the multitude of stars he can see. He then maps out the previously observed stars along with the new stars in the belt of Orion and the Pleiades, showing that there are over 10 times more faint stars than ones seen with the eye. He then scrutinises the Milky Way, and shows that this is made of large numbers of faint stars. Finally he turns his telescope to certain features called Nebula (not the same as our moden nebula), and shows that these too (the Nebula of Orion and the Nebula in Paraesepe) are composed of multitudes of faint stars. Actually, Orion's Nebula does have a proper nebula in it, but it is unlikely Galileo could have seen it with his instrument. Again, given the primitive nature of his instrument, and the circumstances of making his observations, the star maps he makes are surprisingly accurate. Unlike showing the Moon to be another world, showing that there were many unobserved stars was not quite so much of a shock. It didn't change the alleged celestial nature of the stars, but it meant that large chunks of the Universe were unobservable to us (just like dark matter today). In the mindset of the times, to have large chunks of the Universe unobservable was nearly unthinkable, the Universe was created for man, but what use were unobservable stars? Still Galileo had an even bigger surprise waiting in the wings. Planets no one had ever seen before. Next week, we look at his section on the Moons of Jupiter. All I can say is that that it is better than my previous attempts. Too much turbulence still. This time I was in 640x480 mode. Makes a bit of difference. Might try the Barlow next time, if the sky is a little stiller. or at least a fragment of the shattered satellite, the tracked fragment 1993-036PX. It will come down sometime on March 12 (universal time). The story is at Spaceweather. But where will it come down? and at what time? I can't find any predictions for that. Now, the cosmos debris passes over Australia, and it is possible that re-entry could occur over us. But where to look? You can get the TLE data for the tracked Cosmos fragments here (check it regularly as the orbits will evolve rapidly). You can load the TLE data into many planetarium programs which will display the satellite tracks. Of course, the way it is labelled is such that you will have 352 entries labelled cosmos 2251 DEB. So here is the TLE data for just 036PX itself. I've edited the TLE file so I can actually find it in SkyMap. 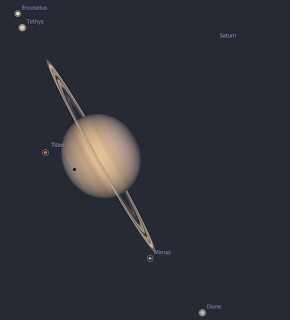 The diagram above (click to enlarge) shows the most promising tracks of 1993-036PX on the 12 and 13 of March as seen from Adelaide (the others occur around 8 am, and will not be visible). You will really need to make specific maps for your own region, but it looks like a good time t look for a re-entry is low to the west between 10:00 pm to midnight on the 12th to 13th. Nothing is guaranteed, it might comedown somewhere else, but its worth having a look. Over at my blogging buddy ERV's place, there's a lot of arguing going on , which at one stage segued into a silly argument about Occam's Razor and the Heliocentric vs Geocentric theories (See William Wallace's post and subsequent posts, and William Wallace's own webpost on this topic). When multiple competing hypotheses are equal in other respects, the principle recommends selecting the hypothesis that introduces the fewest assumptions and postulates the fewest entities. As well, you need to understand that in describing cosmological systems, the preference from antiquity to Galileo was to explain heavenly motions in terms of uniform, circular motions. We may see this as weird or foolish now, but it wasn't back then. Now, on to William Wallace. Okay, there are several things wrong with this. One: Occam's razor isn't "simplest explanation is probably right" (see above). Secondly, Tycho Brahe didn't reject heliocentrism for geocentricism. A little explanation. If the Earth is the centre of the universe, with the planets and fixed stars revolving around it with uniform circular motions, you should see the all the planets move smoothly across the sky at the same pace and the same brightness. But they don't. The inner planets, Mercury and Venus, never move far from the Sun and change radically in brightness. The outer planets move across the sky, then stop, reverse their motion, stop again, then move back the way they were going in the first place. Any geocentric explanation has to explain this retrograde motion. Ptolemy solved these problems. First, he had the planets not orbit the earth directly, but orbit a point that itself orbited the Earth. This is the epicycle (for an animation see here). Mercury and Venus required somewhat more complicated solutions (see here for an animation of Mercruy in a geocentric system) than for the outer planets. Even so, this system still didn't quite work. Ptolemy also introduced the equant, the planets did not in fact orbit the Earth, but orbited a point some distance away from the Earth. It worked, and the Ptolemaic geocentric system was the standard description of the Solar system until the time of Copernicus. Copernicus, of course, moved the centre of the universe to the Sun, and had all the planets, including Earth, revolve around that. Now, in terms of Occam's razor, Copernicus's heliocentric system should have been an outright winner. Both the Ptolemaic system and the Copernican system explained retrograde orbits and the reason Venus and Mercury never travelled far from the Sun, but the Copernican system got rid of the ad hoc large epicycles, the retrograde motions of the planets were natural results of the planets orbiting the Sun, as was the explanation of Venus and Mercury not moving far from the Sun, as they orbited inward of the Earth. Most importantly, the ad hoc equant was removed. In the time of Copernicus, getting rid of the equant was more important than many other innovations, as the equant represented a departure from the ideal of explaining the solar system using uniform, circular motion. The Copernican system also explained things the the Ptolemaic system didn't. It gave a natural explanation for the ordering of the orbits of the planets, it also explained the precession of the equinoxes and the seasons. So, not only did the Copernican system explain the same facts as the Ptolemaic system with fewer ad hoc assumptions, it had greater explanatory power. It did require the assumption that the Fixed stars were very far away, but that was no more ad hoc than the Ptolemaic assumption that they were relatively near. So, in the Occam's razor stakes, it should have won hands down, and indeed the Copernican system was popular with northern European astronomers. Southern European, not so much. Rejects the Ptolemaic system. He makes a system where all the planets bar Earth orbit the Sun (animation here) and the Sun with its panalopy of planets orbits the Earth. It's a kludge, an obvious kludge. The orbits of Mars and the Sun intersected for criminies sake! In terms of Occam's razor, Tycho's helio-geocentric system fails, introducing unwarranted assumptions. The parallax issues was a problem, but again, if the fixed stars were far away (as they were), then parallax would not be observable. The observations of the phases of Venus by Galileo, and of the Moons of Jupiter meant that the Ptolemaic system (which Tycho rejected) was wrong. Interestingly, Galileo observed changes in the timing of the eclipses of the Moons of Jupiter that could be accounted for only by the parallax changes due to an orbiting Earth, but didn't realise it. In 1613 the annually periodic seasonal variations of sunspot trajectories across the sun's disc was discovered. This fitted with the hypothesis of a rotating earth, and not one of an orbiting Sun. Then in 1729 James Bradley discovered stellar aberration, which can be only explained by a rotating, orbiting Earth. Finally in 1838 , Friedrich Bessel made the first successful measurements of stellar parallax. Tycho did not accept the Copernican system, but neither did he accept the geocentric Ptolemaic system. His rejection of the Copernican system in favour of a more complicated system of his own devising was a failure of Tycho, not of Occam's razor. Indeed, the Earth does rotate around the Sun, and choosing Occam's razor would have given us the right result (As Tycho's system made more unwarranted assumptions than the Copernican system - Stars close to earth, two centres of rotation and crossing orbits). Well, it's basically over now, that's what I get by being distracted by the sky. But I have a point I want to make. He also said Pluralitas non est ponenda sine necessitate which translates as "plurality should not be posited without necessity." Stellarium 0.10.1 is now out. It's a bit faster on my system, has a couple of nice amendments once you get used to the confusing way they have re-jigged the menu. Hint guys, releasing the manual for 0.10 at the same time as the program would be a great help (currently the manual page points to the Stellarium 0.9 manual. I mean, a slider for governing what planet labels are available? That makes no sense. But, and this is a big but for me, you can't run your old scripts. Or the script archive at the Stellarium Wiki. There is a note on the main page saying "as well as: a new script engine (in testing)". That means they have completely changed the script language and none of your scripts will work. Without a manual describing the script system, there is no reasonable way to find out what the new commands even are! Not that there are not some hints. Mathew Gates has made a lunar eclipse script (in the sripts foleder of the new Stellarium 0.10.1) to duplicate the old lunar eclipse script in 0.9 giving examples of old vs new commands. Yeah, they made the script language into a VB-like monstrosity. It almost certainly is more flexible, at the expense that most normal folks won't be able to make scripts at all. Check out the Zodidiac.ssc script in the new system, pure programmerese. They have remove the script recorder, so there is no way to "roll your own". I'm rather annoyed, as I've been trying to make an archive of Stellarium scripts that could be used for teaching purposes, and now I have to completely rewrite them (eventually, when the manual comes out). One poor individual even downloaded Stellarium on my say so, and now can't run any of my scripts or the Wiki scripts. Nice work folks. Also, new scripts have a .ssc ending, just like Celestia scripts! Nice way to avoid confusion folks! So, if you make use of scripts a bit in Stellarium, stick with 0.9 for the moment. Carnival of Space #93 is here. Carnival of Space #93 is now up at the Planetary Society Blog. There's a new cataloh of exoplanets, the demise of the ISS space tourist, RingEarth, robot explorers and much, much more. Why not get into a transfer orbit and shuttle on over? The Australian sky looking north-east at around 9:00 pm local daylight saving time. 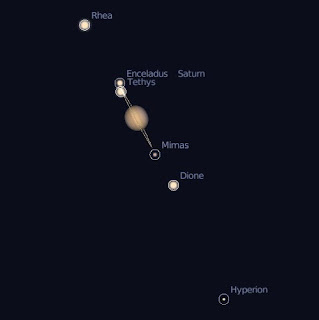 Saturn is at opposition, the time when it is biggest and brightest as seen from Earth, tomorrow on Monday 9 March. 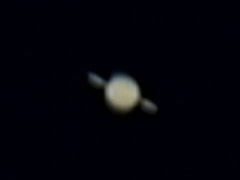 Now is a great time to see Saturn in a telescope, even a small one. Saturn will be visible all night, and get high enough in te sky to get above most of the murk of the horizon before bedtime. While tomorrow night Saturn is at its biggest, as a giant planet in a wide orbit, it will remain a fantastic sight for weeks (unlike Mars which rapidly changes size). Saturn's rings are edge on, which only happens every 14-15 years, so you are in for a rare treat. If you don't have a telescope, pester a friend who has one. If your friends don't have a telescope, get together and go to your local astronomical societies or local observatory/planetarium's open night. You won't be sorry. We are at Womad this weekend, and while listening to music, staring at the sky through the Monkey Puzzle trees with my beloved partner the Bettdeckererschnappender weisle at my side, I had occasion to reflect on failure. My beloved partner and I have listened to amazing music perched on rocks in forest amphitheatres, in planetariums, in old Irish country pubs and in the old city of Brandenburg. We had stood in the ruins of the Frauenkirche and old megalithic monuments. We have hiked the Ironbound ranges, stood on the summits of Snowden and Kosciusko. We have bicycled the Mekelenberg Seeplate and the backblocks on Victoria. Through volunteer work with environmental groups we have helped in some way to leave the world a better place for our children. We have three wonderful children who may just be persuaded not to build giant killer robots. Through my research I have added a little to the sum of human knowledge, I have seen my students take their first steps into the wide world and begin to make careers which will make a difference to human health. I have helped push back the tides of ignorance a tiny bit, and I have helped people appreciate the wonderful skies above us. But, according to Jacques Segula, advertising guru and confidant of French President Nicholas Sarkozy, anyone who is over 50 and doesn't have a Rolex watch has "failed his life". Well, I'm past 50, and I don't have a Rolex. If this is failure, I'm proud to be a failure. Venus is very low on the western horizon now, a mere three fingerwidths above the horizon half an hour after sunset. In one week it has swelled in size and become a really thin crescent, potentially observable in even 10x50 binoculars (provided you have good optics). The next few days will be your last chance to see crescent Venus before it disappears into the glow of twilight. Do have a look, and remember, it was Galileo's discovery of the phases of Venus that finally demolished the Ptolomeic geocentric universe. Last night the could parted for a short time and allowed me to seethe dim fuzzy patch that was Lulin floating above the beehive. It was beautiful. Cosmic Diary is an IYOA initiative to let people see astronomers at work. The latest feature article is about what goes on inside a star. 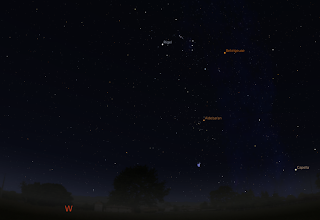 The sky as seen from the north east around 9:00 pm local time in Australia (click to enlarge). Fading comet Lulin can still be seen in binoculars, and on Friday March 6 Lulin passes withing a binocular filed of the Beehive cluster. The glowing patch of the comet and the twinkling stars of the Beehive would look beautiful together, but the waxing Moon may dim their splendor somewhat. Have a look anyway (its cloudy here). 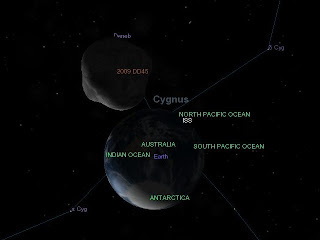 Gerhard, occultation meister who produced this animation of the Earth from asteroid 2009 DD45 (as featured in this post), has had his animation linked to in this article in the Sydney Morning Herald. It's a nice article, with a good interview with Rob McNaught ... although I would have cut back on the doom and destruction a bit (yeah, it's a journalist trope, and a hook to get you in, but please can we have a mention of asteroids without invoking catastrophic impacts) . Having described the telescope, Galileo then turns to describing the Moon as seen through his new instrument. This section shows the puzzlement, if not the initial incomprehension, Galileo had when he first viewed the Moon at magnification. We are used to the idea of craters and mountains on the Moon, but when Galileo first looked, the accepted idea was that all celestial bodies were perfect. The dark splotches so prominent to our unaided eye view were explained in various ways that left the Moon a perfect, unblemished sphere. Now, Galileo more than most was in a position to realise that if the Earth was a planet, as Copernicus thought, then all planets, such as the Moon, might have features similar to those on Earth. But also recall this was the first time a world had been viewed from such a perspective, with a telescope of roughly 15x magnification, with lenses that had spherical and chromatic aberration, and without our fancy telescope mounts. Given all this, it is a wonder that Galileo was able to describe and sketch the Moon as he did. Reading his account, you can almost hear the gears in his head grinding as he tries to make sense of the patches of light and dark revealed by his telescope. Let us note particularly that the said small spots agree always in having their darker parts directed towards the sun, while on the other side, opposite the sun they are crowned with bright contours, like shining summits. Slowly, painstakingly, Galileo describes the effects of sunrise, the appearance of the Moon during different phases. You can see him trying to build a picture of a world that has never been glimpsed before. He also had to convince his audience that what he saw was not mere illusion, an artefact of the telescope. This was not so absurd as it seems to us today. Telescopes were new, and did suffer from chromatic and other aberrations (and even today internal reflections can generate phantom objects). Still, as you can see from one of Galileo's illustrations compared to a modern photograph, for a hand held 15x instrument, he did quite well in accurately depicting the Moon's features (the big crater is today known as Albategnius, it's size is exaggerated due to issues in producing the woodcuts that made the illustrations for the Staryy Messenger). Galileo did more than just describe. He used geomtery to show that these objects must have sustantial size, and indeed were towering mountains. Some of his explanation seem a bit strange to us today, such as positing an atmosphere to the Moon to explain why you can't see peaks and ridges on the limb of the Moon (rather than it being mostly an effect of our eyes being unable to resolve these small features). Still by the end he has convince at least me that the Moon is not a prefect cellestial sphere, by a world that can be compared to our own. The notion that the Moon was not perfect was quite shocking, and some peopel refused to accept this, even some who accepted the existance of the Galilean satellites of Jupiter still refused to accept that the Moon had mountains and craters. That the Moon was a world was quite a subversive notion, and part of the process of demolishing Aristotilean physics neccescary fro acceptig a heliocentric system. If the Moon is a body like Earth, and not a special cellstial object, then Earth can be a planet just like the others, and not be placed in a priveleged postion. If a non-perfect Moon was a shock, Galileo had more shocks waiting. Next week, we look at his section on the stars. 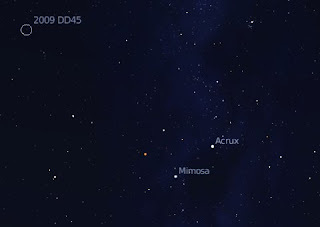 In the wake of setting up Celestia and Stellarium entries for 2009 DD45, I present a simple stellarium script to show 2009 DD45's movement amongst the stars. It requires a bit of a kludge though. #location Okay. Northen Hemisphere misses out. 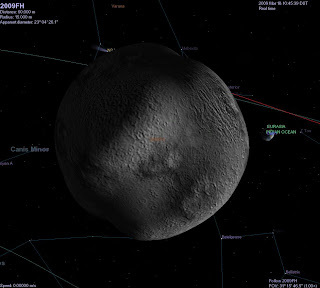 As I've mentioned before, you can add new objects, such as comets and asteroids, to Celestia and Stellarium. I've made up a Stellarium add-on and a Celestia .ssc file for 2009 DD45. A bit late I know, as the object has wizzed by, but you can vicariously enjoy the experience. Here the DD45 files, data taken from the MPC. If you are unsure of where DD45 is use the search function, you have to type in 2009 DD45 for the search to work. If you want to make your own files in the future, you can use the data sources I linked to in my post Making SSC Files for Celestia. Last month I was privileged to be an advance conduit for the top 100 Science Blogs as ranked by Wikio. This month I have been given advance notice again, as my blog is now in the top 50 (48, up from 55, why I don't know. Had a big spike in traffic last week fro no apparent reason). As for last time, not many surprises here; Pharyngula is still number 2, Respectful Insolence is duking it out with Bad Astronomy. Simoastronomy has maintained it place more or less. Read and enjoy.